Martin Wojczynski first married Marianna Jaskolska in Poland. The entry is on line 10 in the following scan. In 1879 on November 16, Martinus Wojczynski of Welna, age 32, married Marianna Jaskolska of Parkowo, age 21. So Marcin and Marianna were married in Poland in 1879 before coming to America. I know that Marcin and Marianna lived in Pennsylvania for some time before moving to Detroit if only because their eldest living daughter, Mary, was born there in 1888. We don't know where they were between 1879 and 1888. If there were other children born, they did not survive. Moving to Detroit between 1888 and 1890, Marcin and Marianna settled near what is now Sweetest Heart of Mary church, and even lived on the block where it was being built in 1891-1892. In the Detoit City directory of 1890, the Wojcinski family lived at 266 Leland. Detroit's street numbering scheme changed and went into effect on January 1, 1921, so this is a pre-1921 address. The Detroit City guide for 1920/21 gives both old and new addresses. Steve Morse summarizes the changes on his web site. From this we see that 266 Leland was between Russel and Riopelle, and would now have a number between 1400 and 1499. This location/street no longer exists, but would be somwhere inside the Pepsi-Cola Plant which is located at 1555 Mack. In 1891 and 1892 The Wojcinski family lived at 400 Garfield (renumbered to 1426 Garfield), also between Russel and Riopelle, located in what is currently the playground that is next to Sweetest Heart of Mary church. In 1893 they moved to a new house (the address did not exist in the 1892 directory) at 363 Garfield (renumbered to 1339), where they stayed from 1893 until 1912. This house would have been located on the far side of Russel from the church, between Russel and Rivard, which is currently occupied by a Detroit Housing Commission complex called Diggs Homes officed at 1331 East Canfield. It's worth noting that Wacław Bartold was listed as living with the Wojcinski family at 363 Garfield from 1909 to 1912. We know that they had two sons in Detroit: Joseph and Wladislaw. But then it gets complicated. It was said that Marianna died in childbirth, but I have been unable to find any record of her death. Wladislaw was born in December of 1891. Marcin was supposedly also the father of Leocadia who was supposed to have been born in December of 1892. Marcin married Franciszka in 1893, so was Marianna Leocadia's mother, or was Franciszka? Since there is no record of her birth, it's difficult to know. There is a record of the birth of Michael in September of 1893, which makes it unlikely that Michael and Leocadia had the same mother. This question may never be answered, since many records from the late 1880s and early 1890s appear to be missing in Detroit. In 1893 Marcin married Franciszka, whose family name I am unsure of. On some documents she is listed as Szyszka, while on others she appears as Jankowska. I've included a couple of scanned documents about Marcin and Franciszka here. 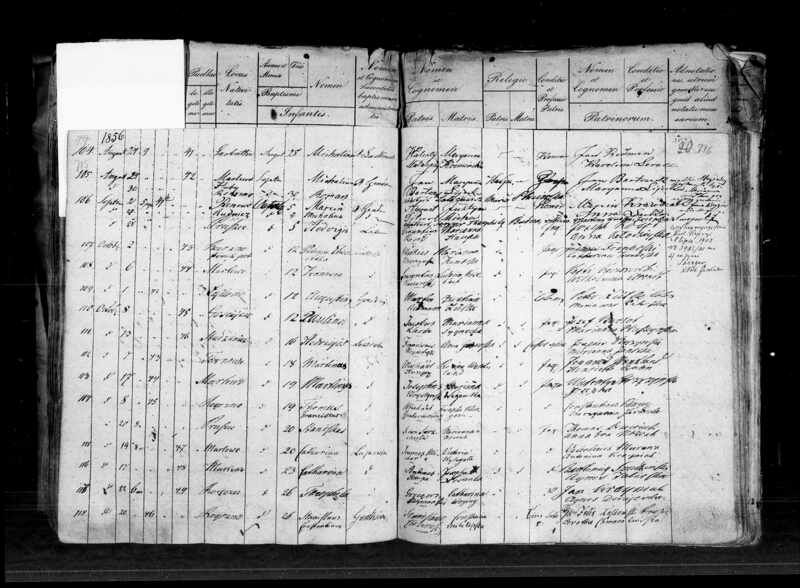 The first scan is the marriage license, and the second is the marriage record where they appear on line 14676. Martin Wojchinski age 34, married Frances Jankowski age 20. Frances gives her parents' names as Michael and Anna. 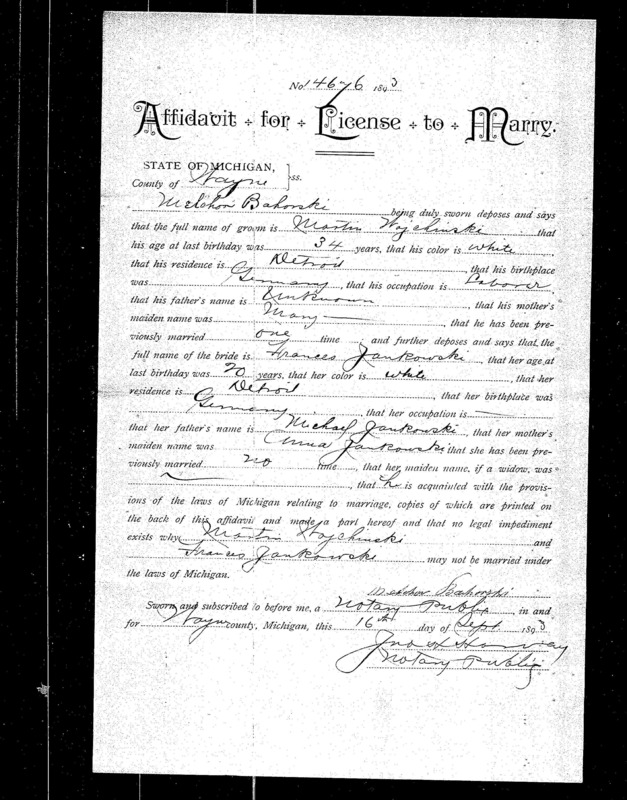 The license was issued on September 16, and the marriage took place on September 25, 1893. D.H. Kolasinski was the pastor. Note that Father Kolasinski was suspended from the priesthood between 1885 and 1897, and the church was not accepted as part of the diocese until 1894. 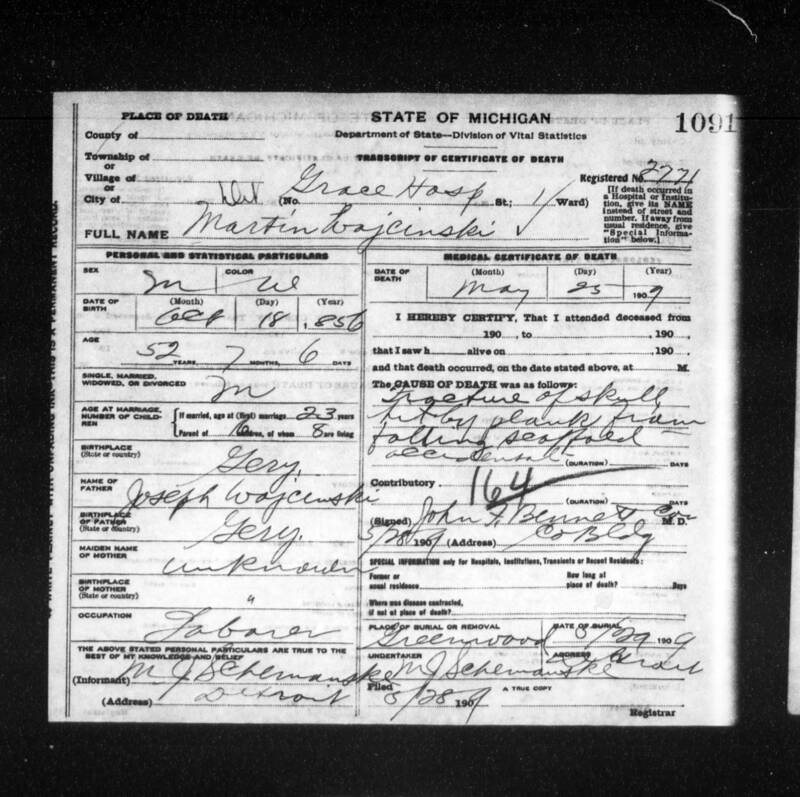 On her son Frank's marriage record, his mother is Frances Szyszkowa. On her son Edward's marriage record, his mother is Frances Jankowska. I have heard that she was running away when she left from Poland, and may have been trying to hide her identity. She was supposed to have been pregnant when she left. Although I am uncertain when she arrived, or where she came from, I have papers where she claimed to have arrived in 1888, when she was 16 years old. We have no record of whether she had a child at that time. 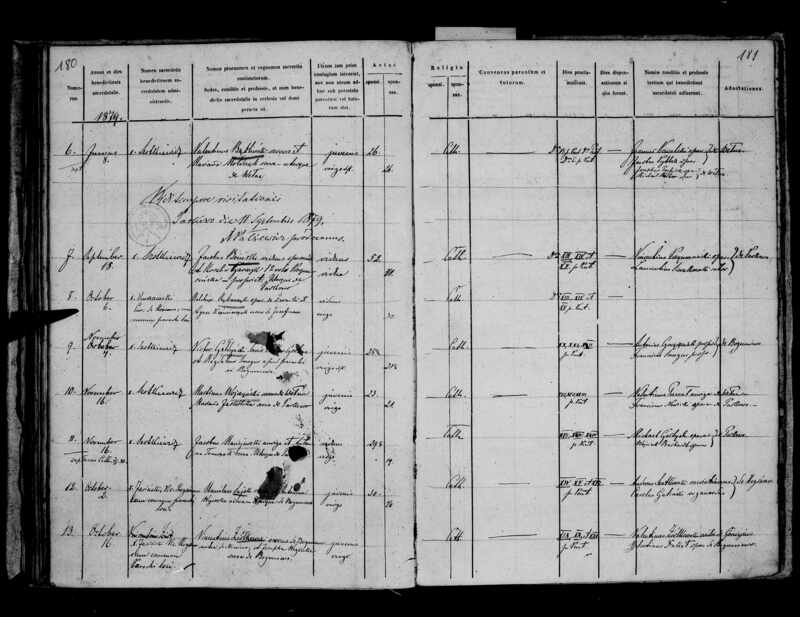 The first record of her in Detroit is from the birth of Michael (who died a short time later), just weeks before she and Marcin married in 1893. Was Michael conceived in Poland and born in America? I'm still looking for clues. On her "Alien Registration" papers, Franciszka claims to have arrived in 1888, and was born in 1872 in Rypin, Poland. That means she would have been sixteen years old and traveling alone, which seems unlikely. If true, she should have had a child in 1888 or 1889, but I have no record of that yet. It makes more sense that she was pregnant with Leokadia in 1892 or Michael in 1893 when she arrived, as a 20 or 21 year old. Since there is no birth record for Lilly, it is difficult to know who her mother was. It makes sense that since she grew up knowing only Franciszka, she may have been told that Franciszka was her mother. But the dates don't appear to work. Interesting side note: Marcin and Franciszka were married by father Dominic Hippolytus Kolasinski at Sacred Heart of Mary church in 1893, which was not part of the Roman Catholic Diocese at the time. When the church was admitted to the Diocese in February of 1894, it was renamed Sweetest Heart of Mary. Father Kolasinski had been ex-communicated by Bishop Borgess in 1885, and was not re-admitted by Bishop Foley until 1897. The baptisms of Joseph, Ladislaus, Leocadia, Rozalia, and the marriage of Martin to Franciszka may not have been proper in the church. Martin died in 1909 in an accident at work. Martin's death certificate states that he had sixteen children, but only eight living. 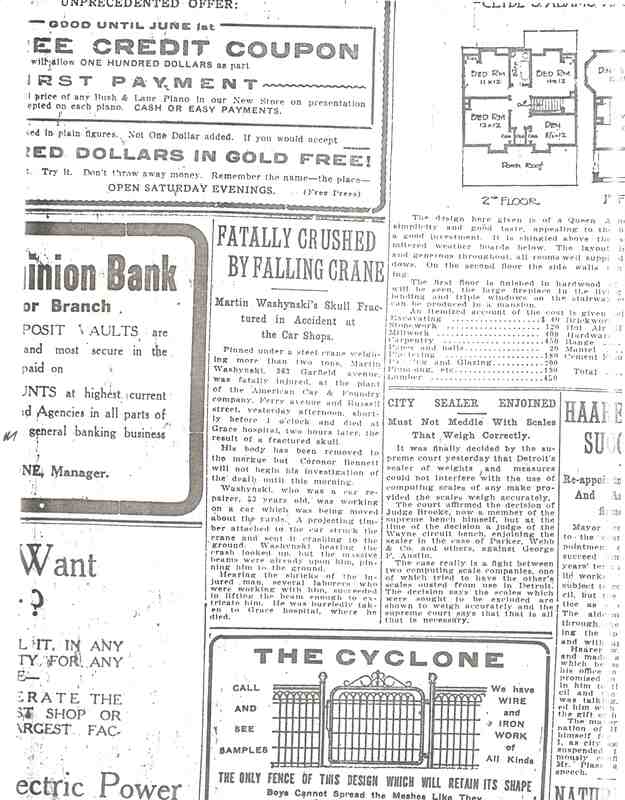 The death was reported in all the local papers. I've included scans from the Detroit Free Press, the Detroit Times, and Dziennik Polski. Mary (1888) married John Wisniewski (1882-1934). They had Joseph (1909-1928), Mary (1910-1933), Helen (1912), Leonard (1913), Raymond (1916), and Irene (1918). Joseph (1890-1968) married (1914) Martha Litzan (1889). They had Dorothy (1916) and Joseph Jr. (1919). They changed the family name to Walters between 1920 and 1930. Ladyslaus (1891) is a complete mystery. We have no info on him past 1910. Leocadia (1892-1981) went by Lillian and married (1911) Frank Kochanski (1886). They had Eleanor (1913), Alvin or Albin (1916-1975), and Frank Jr. (1920). Rozalia (1894-1971) went by Rose and married (1911) Waclaw Bartold (1886-1960). They had Emily (1912-1986), Chester (1915-1979), Mitchell (1918-2008), and Norbert (1928-2008). Frank (1898-1967) married (1921) Francis Novak (1901-1972). They had Robert (1923), Virginia (1925), and Wilbert (1932). Edward (1903) married (1922) Anna Budzinska (1903). They had Raymond (1924), Leonard (1925), Delphine (1926), Ralph (1932), and Barbara (1935). Leonard (1906-1974) married Theresa (1907-1974). They had Alice (1928), Gerald (1932), and Leona (1934). We know about at least 5 children that did not survive. Michael (1893-1893), Martin (1897-1898), John (1901-1901), an unnamed girl in 1900 and an unnamed boy in 1908. Martin was buried at Greenwood Cemetery in Detroit. It is also known as Sacred Heart of Mary Cemetery, because it was established by Father Kolisinski for the church they built: Sacred Heart of Mary. The church changed its name in 1894 to Sweetest Heart of Mary, but the cemetery retained the old name. Martin and Marianna, along with the children who died were buried there, but all of their graves are lost, mainly because records were destroyed in 1989, and also because they were buried in a low-lying part of the cemetery which was later covered by about 3 feet of soil. Here are the papers I received about Franciszka from UCIS. 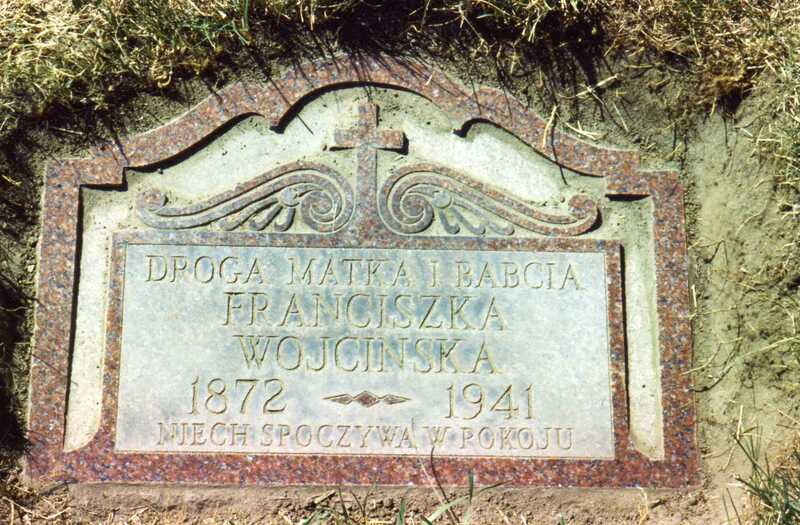 Franciszka died in 1941 and was burried at Mt. Olivet Cemetery, not at Sacred Heart. At that time, my father, her grandson, Chester Bartold, was working as a mortician, and signed her death certificate as funeral director. Wladislaw baptized 1891-12-26, born 1891-12-14, parents are listed as Martinus Wojczynski and Marianna Laskolska. Leokadia born 1892-12-11, but no birth record has been found. 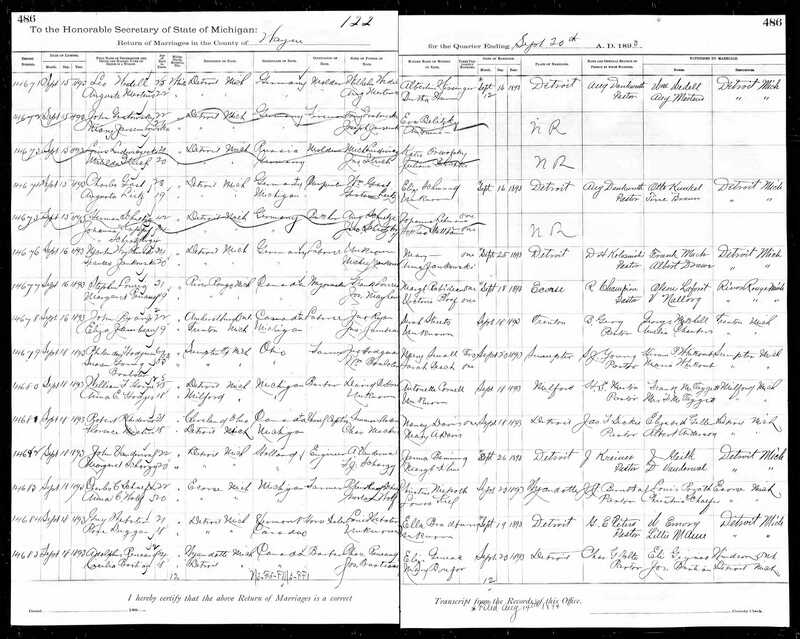 Michael born 1893-09-01, parents are listed as Francis and Martin Wocinski. Rose born 1894-09-15, baptized 1894-08-19, parents are listed as Martin and Frances Szyszek in church records. 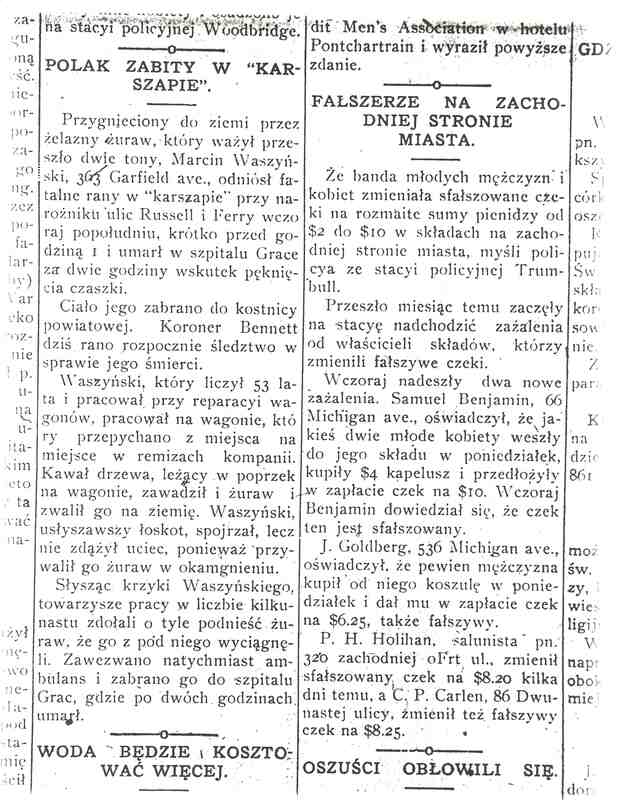 In civil records I've only found a Rozalia born 1894-08-15, with parents listed as Francis and Martin Wirskinski. Wlad was definitely Marianna's son, and Rose was definitely Franciszka's daughter. Between them Lilly and Michael were born. Lilly states she was born in Detroit 11 December 1892. Michaael was born less than nine months later. Michael was conceived before Leokadia was born. So Lilly and Michael had to have different mothers. But who's whose? In either case, Marcin was likely the father of Mariann's child and probably not the father of Franciszka's child. It is likely that the father will never be found. It seems likely that Lilly was Marianna's daughter, while Michael was Franciszka's son. If Leokadia was Marianna's last child, Marianna died in 1892 giving birth to her. And Lilly would be Franciszka's foster child. However, this is contrary to what was claimed in the 1910 census. Lilly is listed as Franciszka's daughter, even though Joe and Wlad are listed as foster children. The other possibility would be that Michael was Marianna's last child, and she died in 1893. But that would have been just three weeks before Franciszka and Marcin married. Leokadia would have been Franciszka's daughter born out of wedlock. That might be why it has been impossible to find her birth record. 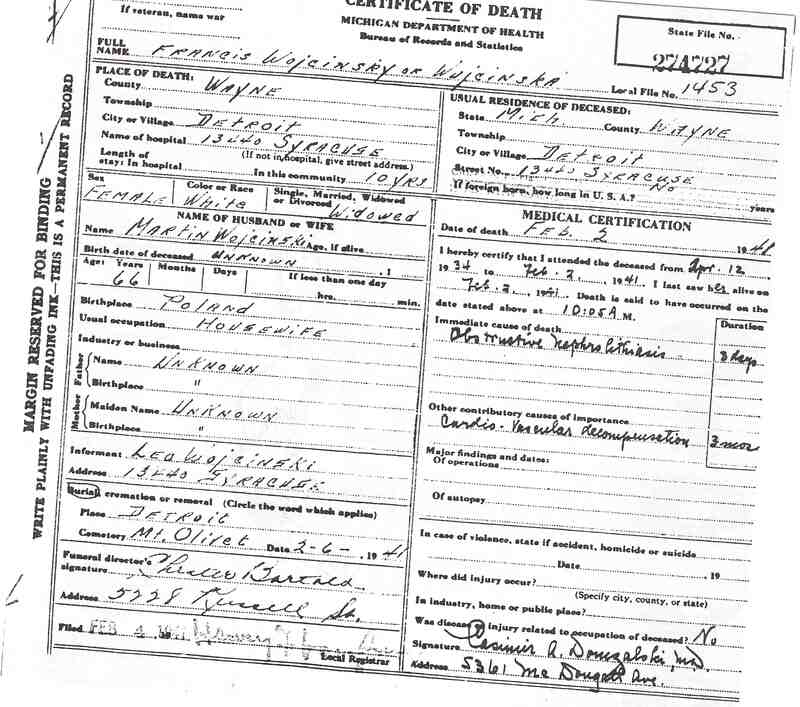 Since we beleive that Marianna died in childbirth, it should be possible to find her death and determine which birth was associated with that date. Unfortunately, my searches have turned up nothing. We have also heard that Franciszka was pregnant when she arrived in the USA. If Franciszka left Poland in 1892-1893, pregnant with either Leokadia or Michael, she would have been 20-21 years old at the time. But Franciszka claims that she left Poland in 1888, when she was 16. Franciszka states she arrived in New York on Mar 9, 1888 on the S.S. Hamburg, but the Hamburg was not launched until 1899. If she arrived in New York in 1888, she would have been processed at Castle Garden. In 1893, she should have gone through Ellis Island. Although she lists her maiden name on this form as Szyszka, their marriage license lists her name as Jankowski. Searches for names like Jankowska or Szyszka on passenger lists have not turned up any results. She also states that she was born in Ripin in 1872. Unfortunately, "genealodzy" only has records up to 1739 for the Rypin parish. The mystery of Wladislaus remains, but we do have some information. Wladyslaw started using the name Walter. In the 1910 Detroit City directory Jos and Walter are listed at 363 Garfield, along with Frances (wid Matthew). This was the Wojcinski home at the time. In 1911 Walter is no longer listed, but, side note, "Waclaus Bartold" is: he may have moved in after Martin's death when Franciszka started taking on boarders to help with expenses. There is a Walter Wojcinski who was born in Detroit in 1891 who enlisted in the army on April 4 in 1911, and as discharged with a disability on July 1st of the same year. He registered for the draft on June 5 in 1917, listing his birth date as 14 December 1891. On that card it lists his occupation as Sailor. So Wlad may have become Walter the Sailor. My grandmother Rose Wojcinski was born in Detroit in 1894. She married in 1911 to Wacław Bartold who was, at the time a foreigner. 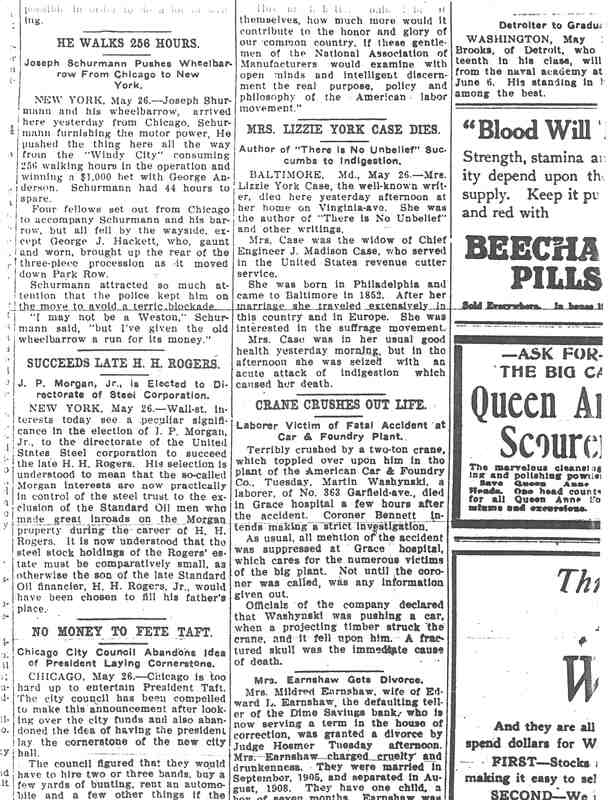 Because of the Expatriation Act of March 2, 1907, she lost her citizenship, and she never applied to get it back after September 22, 1922, as allowed by the Cable Act of 1922 when she could have. The Expatriation Act required a U.S.-born woman who married a foreigner to "take the nationality of her husband." Since Wacław had left "Russian Poland" before 1920, he was "Russian". Rose did not gain Russian citizenship, she simply lost her USA citizenship. According to the Smith Act of 1940 aliens in the country needed to register their status at the start of World War II. At that time Franciszka was still alive, and registered. In addition to that her daughters, Lilly and Rose, who had married aliens before World War I, had become, by marriage, aliens, and needed to register. Lilly married Franciszek Kochanski in 1911, and she lost her US citizenship. Rose married Wacław Bartold in 1911 and she lost her citizenship. Lilly actually got caught and had to file to become a citizen. Apparently Rose never did. Lilly was repatriated in 1940. Since Rose never filed in 1940, she had committed a crime and would have been staying in the country illegally. Here are the papers I received about Lillian from UCIS. They reported that they had no papers on Rose. I've included a printout of the family, with all the data I have from myheritage.com. This is a work in progress, so I still need to add some of the information that I've reported above. Copyright © 1997-2018 by Thomas M. Bartold. All rights reserved. may be duplicated in any fashion without the author's consent.